"Dorothy Priscilla Haskell, Westbrook College, Class of 1977"
Westbrook College student Dorothy Priscilla Haskell, Class of 1977, was an Executive Assistant major and a Day Hop. 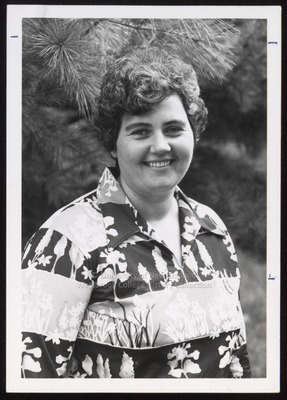 For her senior class candid photo, which appeared in the 1977 Tower Yearbook, she wore a v-neck blouse with silhouetted leaves and ferns decorating the front. Her hair was short and curly. Dorothy stands in front of a white pine tree branch, symbol of the state of Maine.